I am posting this rice for a special reason today. It is a sweet friend's birthday today who is also a fellow blogger. She is Priya Ranjit who blogs at Cooks like Priya. She is a lovely, bubbly person. Whenever I have conversation with her, there will be smiles, giggles and laughs. Our group of friends have decided to celebrate her birthday by giving virtual treat of recipes in pink color. Cook the rice and let it before using it. Wash, clean and slice the cranberries and set them aside. Thinly slice the onions, slit the green chillies, grate ginger and keep them ready. 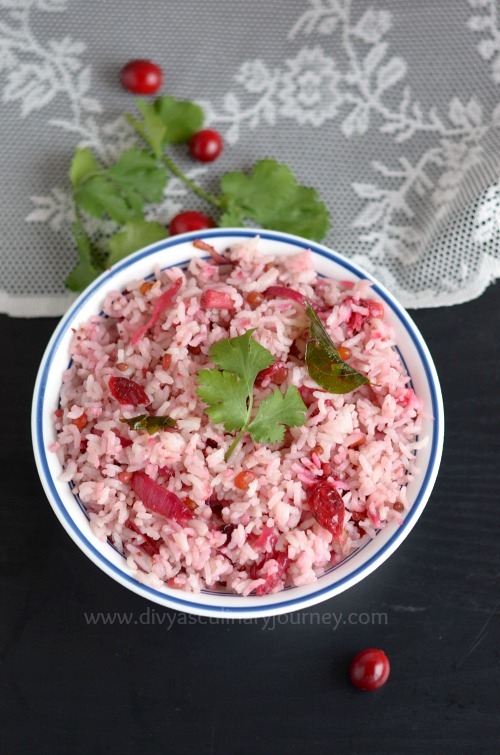 How Cranberry Rice is made? Heat oil in a skillet, add mustard seeds and when they crack, add urad dal, channa dal and fry for a minute. Then add curry leaves, onion grated ginger, green chillies and fry till the onions turn translucent. Now add the sliced cranberries, sprinkle little water, cover and cook for few minutes till it turns mushy. Then add the cooked rice, required salt and mix well. You can use frozen cranberries, too just thaw, clean and use. Add more green chillies, if you want to make it more spicy. This is something different! Looks delicious! 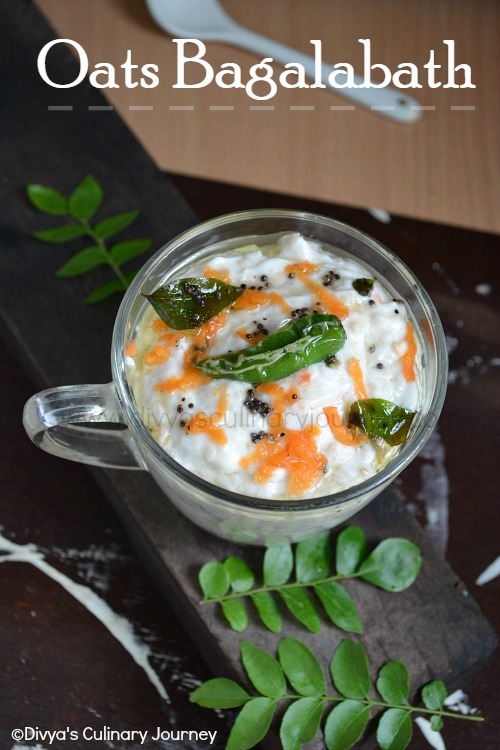 Looks yumm.. and very innovative recipe. So creative dish. Colourful too. A real kids friendly recipe. Nice Color, I love cranberries in Salad! 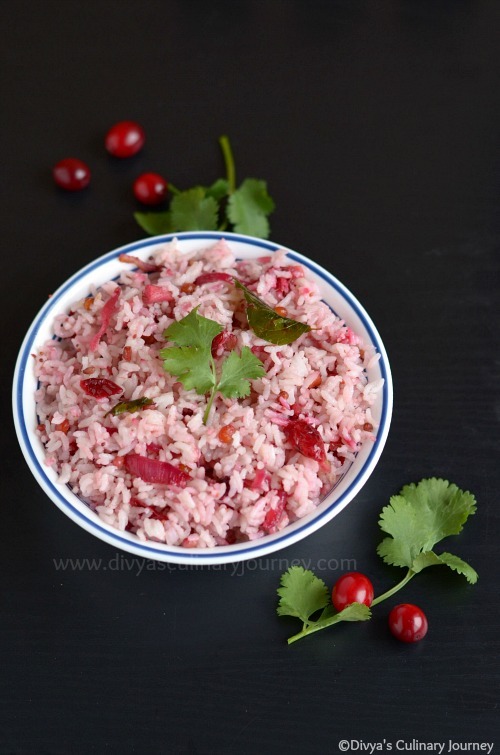 I have tried Cranberry Pulihora! 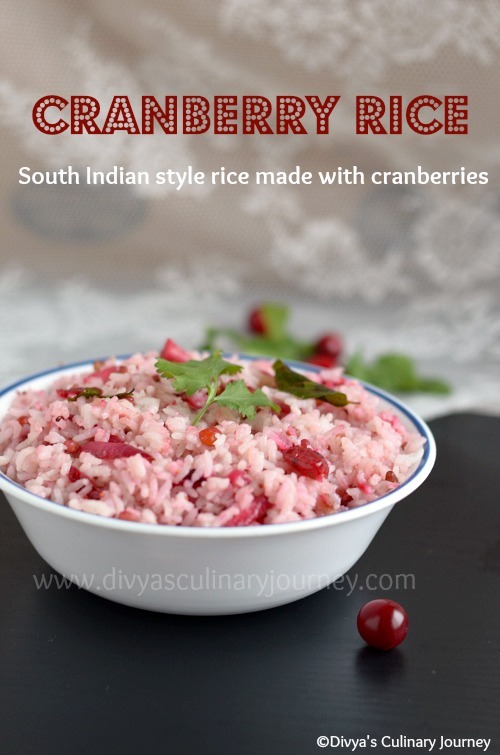 Unfortunately i dont get fresh cranberries, wish i get them here..Rice looks very pleasant and delicious. Looks really yummy and delicious..
such a lovely color to the rice! I made this yesterday as well and it was really yummy!